Fashionware is a product lifecycle management (PLM) solution designed for fashion businesses. The platform provides easy-to-use and time-saving tools for creating, managing and sharing digital libraries, tech packs, sample requests, color palettes, fabric and trim cards, and line sheets. Teams can collaborate in real-time from anywhere with Fashionware’s cloud-hosted system. Users can securely share design concepts, create tech packs, draft visual custom reports, and send inputs and approvals for virtually all processes related to running a fashion brand. The software is easy to set up and use, so that teams can be more productive and keep up with fast-paced trends that require them to process multiple requests and accommodate frequent changes. Fashionware PLM is designed to improve the way fashion companies manage their design and product development workflows. The system has various productivity tools for streamlining daily operations and collaborative tasks so that teams can get more work done, produce more garments, and meet deadlines. Even those with limited technical expertise won’t have a hard time operating Fashionware. It is easy to set up so that organizations can implement usage immediately. The program is highly intuitive so that users can navigate it easily and quickly, making it useful for brands that handle numerous, complex and frequent changes to their products. Companies do not need to worry about security breaches as Fashionware PLM assigns user permissions to control company data. Only authorized employees, vendors, and manufacturers with specific approvals can share, review, and update materials in order to maintain the accuracy and privacy of the cloud-hosted assets. Fashionware PLM serves as a Digital Asset Management platform as users can quickly and conveniently build digital libraries of color, fabric, trim and style concepts. Users can easily retrieve materials with the software’s extensive search capabilities that come with filtering features. All data are produced in real-time and can be extracted to generate visual reports. Real-time collaboration features allow all types of users to stay on top of production deadlines and avoid communication errors. Features include real-time discussion threads, urgent notifications and inline messaging, which can be rolled out event with authorized external business partners. Fashionware has tools to help brands with sample tracking. Users can manage the sample approval process more effectively with supporting images, construction details, style specifications, cost sheets and Bills of Materials. 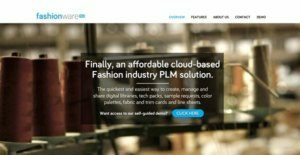 If you are considering FashionwarePLM it might also be a good idea to analyze other subcategories of Best Apparel Management Software collected in our database of SaaS software reviews. It is crucial to note that almost no app in the Apparel Management Software category is going to be an ideal solution able to match all the requirements of different company types, sizes and industries. It may be a good idea to read a few FashionwarePLM reviews first as certain services may dominate just in a very narrow set of applications or be designed with a really specific type of industry in mind. Others may work with an intention of being easy and intuitive and as a result lack complex features needed by more experienced users. You can also find solutions that cater to a large group of customers and provide a complex feature toolbox, but this in most cases comes at a higher cost of such a service. Make sure you're aware of your requirements so that you select a solution that provides exactly the features you look for. How Much Does FashionwarePLM Cost? We realize that when you make a decision to buy Apparel Management Software it’s important not only to see how experts evaluate it in their reviews, but also to find out if the real people and companies that buy it are actually satisfied with the product. That’s why we’ve created our behavior-based Customer Satisfaction Algorithm™ that gathers customer reviews, comments and FashionwarePLM reviews across a wide range of social media sites. The data is then presented in an easy to digest form showing how many people had positive and negative experience with FashionwarePLM. With that information at hand you should be equipped to make an informed buying decision that you won’t regret. What are FashionwarePLM pricing details? What integrations are available for FashionwarePLM?